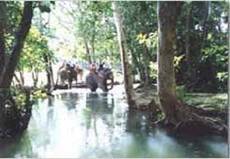 Trip Description : They say an elephant never forgets, one thing for certain you will never forget your elephant trek. There is no better way to enjoy some of the most spectacular scenery Krabi Province has to offer than from the back of one of these gentle giants. We have two treks to offer you: a two hour and a half day trek. These treks start at a time convenient to you that can be arranged at time of booking. Period : 09.00- 15.00 hrs. 09.00 hrs. 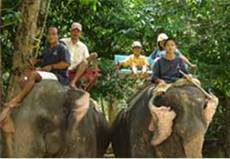 We are based at Baan Nai Sra just 20 minutes drive from Krabi and there we invite you to climb aboard one of our five elephants. Then suddenly you're high above the ground and heading into this amazing scenery where the quiet will envelope you as you relax into the swaying rhythm of the elephant's walk on a one or two hour trek (dependant on 2 hour or half day safari). Our elephants are not working elephants, they work only with tourists; some elephant trekking operations abuse their animals by forcing the animals to trek with tourists after a long day working in the forest, controlling the elephants with fear and violence which can only lead to frustration and anger in these otherwise gentle creatures. All our elephants are well looked after, well fed and watered and above all respected, we hope and believe they are happy; a happy elephant is a safe elephant. After the trek we head to Sra Keaw Cave a huge overhanging cave of multiple tiers each pillared with stalactites which we give you time to explore at leisure, providing you with drinks and snacks. Here you can also swim in the mineral water pool that emerges from the cave and sample some of the local pineapples. It's a good idea to feed the elephants, they won't forget the kindness, but it is watching the dexterity of their trunks that is the real pleasure. You will not believe just how clever and strong these animals can be. 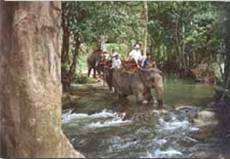 After we say goodbye to the elephants we will show you one of the newer attractions in this ancient landscape by taking you to some of the areas that featured in the movie 'The Beach' starring Leonardo Di Caprio. After which we will transfer you back to your Hotel.